The Young and the Restless (Y&R) spoilers for Thursday, January 24, tease that Mia Rosales (Noemi Gonzalez) will happily arrive for her vow renewal. She’s putting on quite a show, but it’s clear that her heart’s not in this. Mia claims to be committed to her marriage, but Rey Rosales (Jordi Vilasuso) isn’t the only one on her mind. She also tries to pull Arturo Rosales (Jason Canela) closer every chance she gets. Mia even pushed Rey to make Arturo his best man, so it’s clear that this is about anything but love. Nevertheless, the hostile Rosales exes will hold their tongues and get ready to roll. If it’s a show Mia wants, it’s a show she’ll get! The Young and the Restless spoilers say this vow renewal will definitely come with some surprises. Thanks to Wednesday’s agreement with Devon Hamilton (Bryton James), the athletic club will serve as the location of this big shindig. On Thursday, Rey and Mia’s guests will gather to watch them say their vows all over again. It’ll be difficult for Sharon Newman (Sharon Case) to watch, but she’s accepted that this is what Rey really wants. Of course, it’s doubtful Rey’s being honest with himself. He mostly seems to feel obligated since he believes Mia wants him and only him. During the ceremony, Arturo will have a tough time listening to Mia’s empty promises. He’ll know Mia’s just doing to this get back at him and lay it on thick with duped Rey. However, Arturo will have a plan to steal the spotlight from Mia. Y&R spoilers say he’ll make a move that catches everyone off guard. Arturo will get down on one knee after the vow renewal’s over. He’ll gaze up at Abby Newman (Melissa Ordway), pledge his love and ask her to be his wife. Abby will be in shock over Arturo’s sudden proposal and so will several onlookers. Kyle Abbott (Michael Mealor) and Lola Rosales (Sasha Calle) will stand nearby awaiting Abby’s answer. Will Abby agree to lock in her future with Arturo? She might have reservations at first, but Arturo will try to get her on board. Billy Abbott (Jason Thompson) will also turn to Phyllis for comfort, so she’ll worry this is a bad idea. Temptation has proven to be a serious issue for these two in the past. However, Phyllis is with Nick Newman (Joshua Morrow) and now’s really not the time to be unfaithful. Nick’s family hates Phyllis enough as it is! Likewise, Billy is still hung up on Victoria Newman. Despite Victoria’s rejection in Wednesday’s episode, Phyllis may point him back in her direction on Thursday. She’ll know Billy’s a mess and she doesn’t need any more of those right now. The Young and the Restless spoilers say another exciting episode’s on the way. We’ll give you updates as other Y&R news comes in. Stay tuned to the CBS soap and don’t forget to check CDL often for the latest Young and the Restless spoilers, updates, and news. 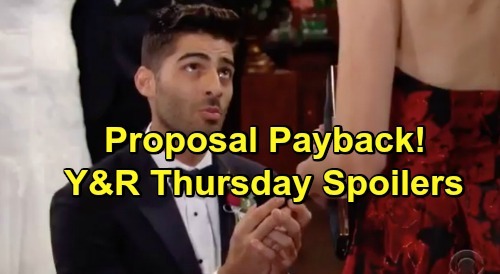 The Young and the Restless Spoilers: Kyle Revealed As Newman Blackmailer – Victor Underestimates Jack’s Son? The Young and the Restless Spoilers: Kyle and Phyllis Hook Up – Huge Twist Shocks Summer and Billy?